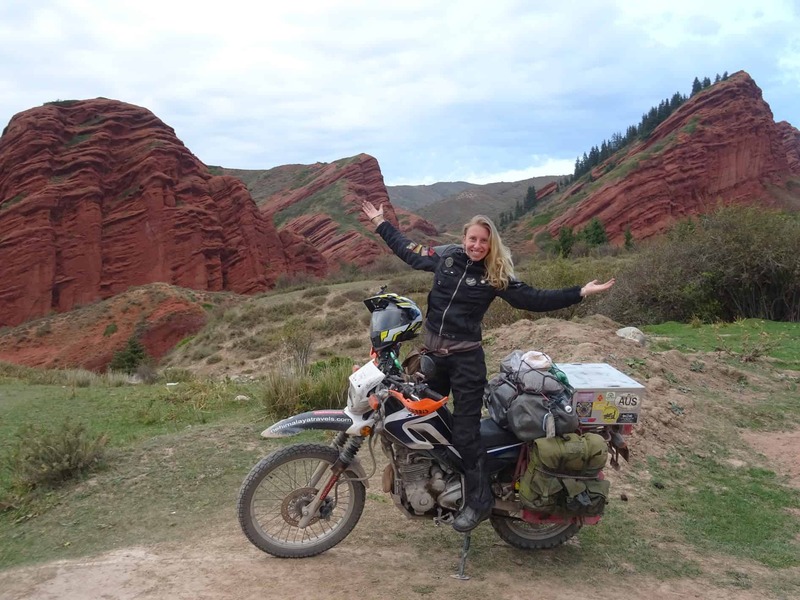 In Mongolia we had the honor of meeting two super inspiring, enthusiastic solo women motorcyclists. Coen, an avid motorcyclist himself soon, got talking to them about their favorite motorcycle tool. One of the women was Marta. 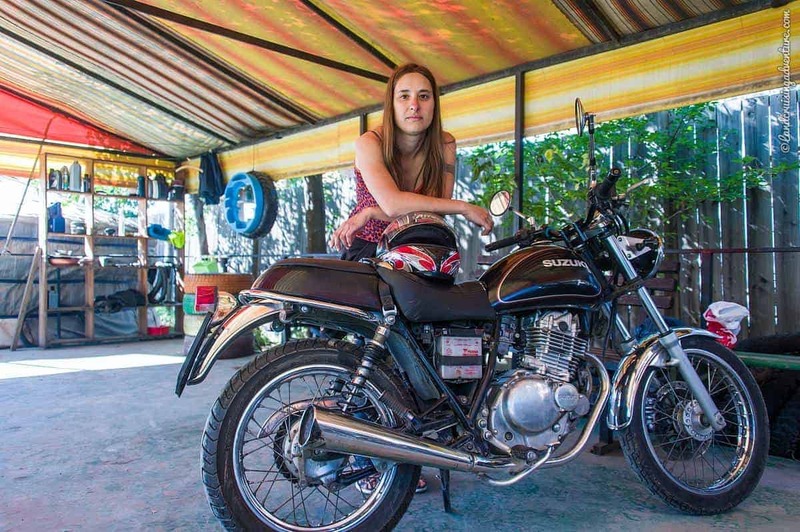 A mere 4 months after she had gotten her drivers license, she got on her 18-year old Suzuki 250 and drove from Italy to Mongolia in 4 weeks time! “Oh yes, all these people talking about doing the Mongol Rally and such, but not doing it… Big talk. I decided to just go,” she commented as if she had taken a side trip to Venice. 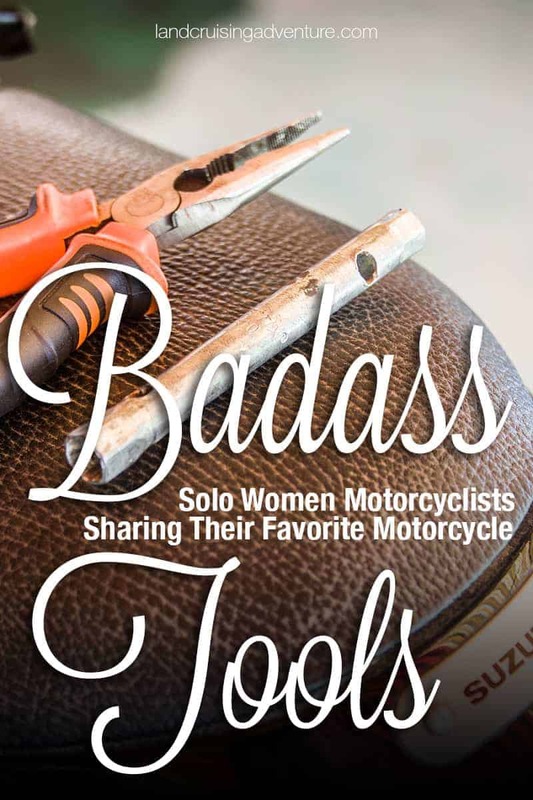 “You want to know which tool I brought?” she answered Coen’s question. “Oh, but I brought only one,” she answered. Right… Talking about going on an adventure. 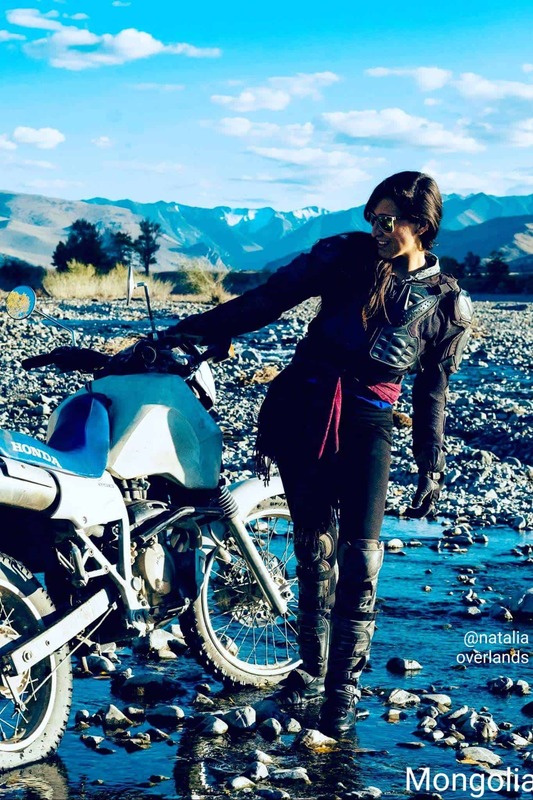 Without further ado, let’s check out these fabulous solo women motorcycle travelers. What an inspiration! 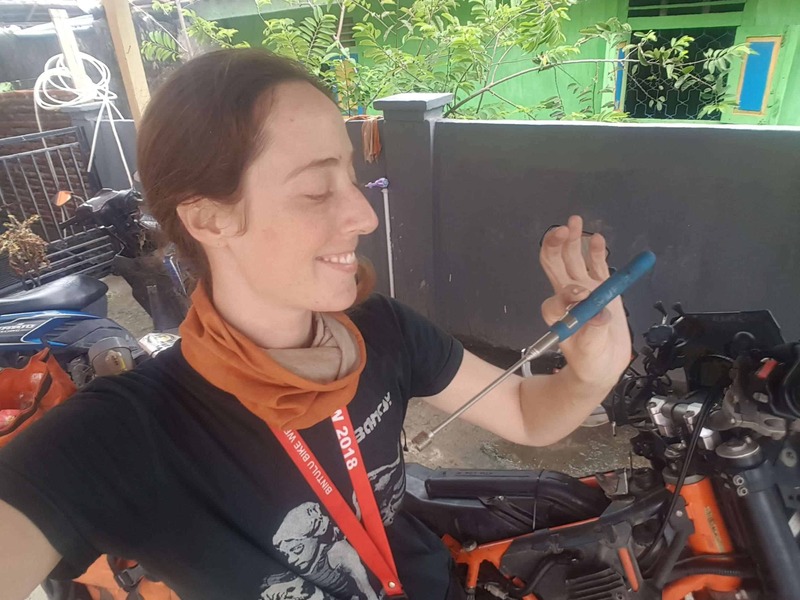 Chantal has traveled Australia, Asia and Europe on her Yamaha xt250 (in Australia called a chook chaser used on farms to chase chickens; people don’t expect these bikes to leave the farm, let alone to travel the world). A full size, probably about 30cm long, ring spanner to undo the rear axle nut. While traveling you always try to lighten the load you carry. But for me weight does not take priority over quality tools. In 70000+ kms of travel you tighten the chain hundreds of times, change the rear tire a few times and do other things that require the rear axle to be loosened so often that it is totally worth carrying that properly fitting, “properly sized”, heavy-as-hell ring spanner. With her dog Indigo, Mayo has done several trips to Marocco on her Honda Goldwing sidecar motorcycle. 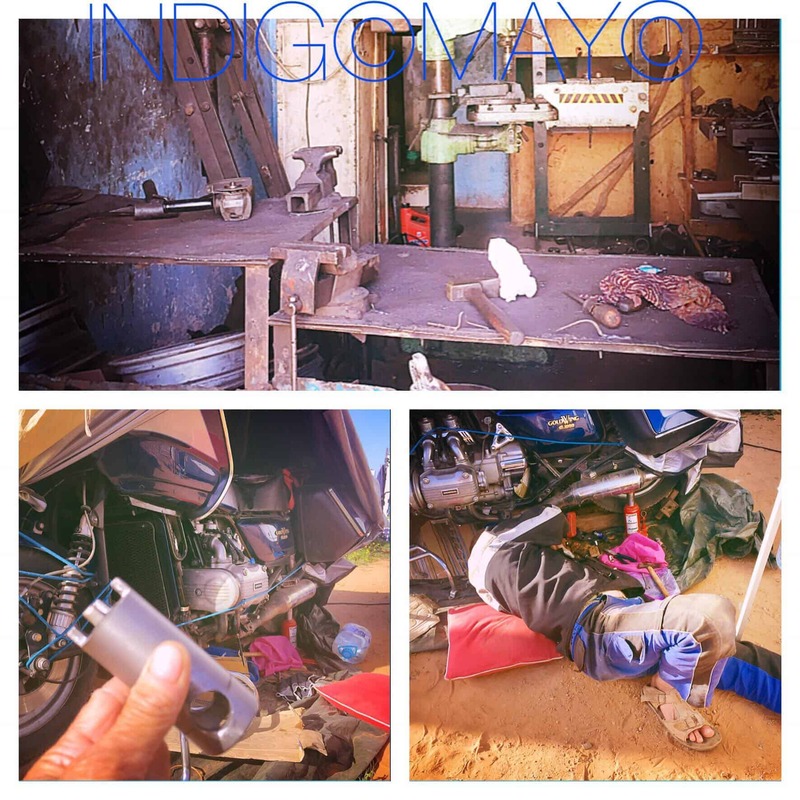 A custom-made Honda tool (but considers Indigo a super tool too). This required an additional question. How did Mayo succeed in getting such a tool made? Who knew how to do that? On arrival in Marokko, I noticed the clutch slipping. One day I was wild camping along the Atlantic Ocean with a friend. When leaving, through sand and up a rocky stretch, the motorcycle lost power. Once on the road it failed on me. 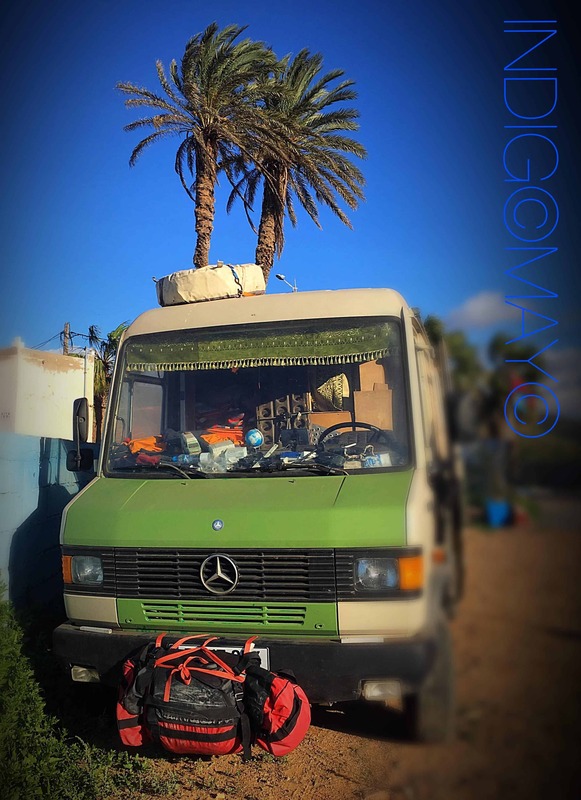 My friend and I attached my tent to the bumper of his Mercedes bus and for the next 50 kilometers he pushed me to the first town. At a police checkpoint I waved as we passed the police officers – they may have been too baffled to stop me. In Sidi Ifni was another friend, one who drives a Honda Goldwing himself and who knows mechanics. He was able to draw the tool and found a metal workshop where they could reproduce it. A Honda Xr250 in South America. A Honda Nx250 in Europe and the Silk Road. A Kawasaki KLX 150 in Southeastasia. A Kawasaki Ninja 500 in USA. A Bajaj Pulsar 220 Nepal. Honda Degree 250 Sri Lanka. Rather than a tool, her favorite gear kept popping up in the conversation, a body protector. This piece of armor has saved my bones so many times. It is fresh in summer because it’s made out of a net with strong plastic patches. On the other hand, when it’s cold I can wear even five jackets underneath it because it stretches. In fact, I did even though I could hardly move my arms though – autumn in Mongolia is cold on a motorcycle. The protector also makes people think I am a muscled, strong woman even when I am far from that, which makes me feel more protected and secure. It has been nice to see little girls looking at me with a surprised face, kind of seeing a different role model – the opposite of the typical stereotype of women being weak. 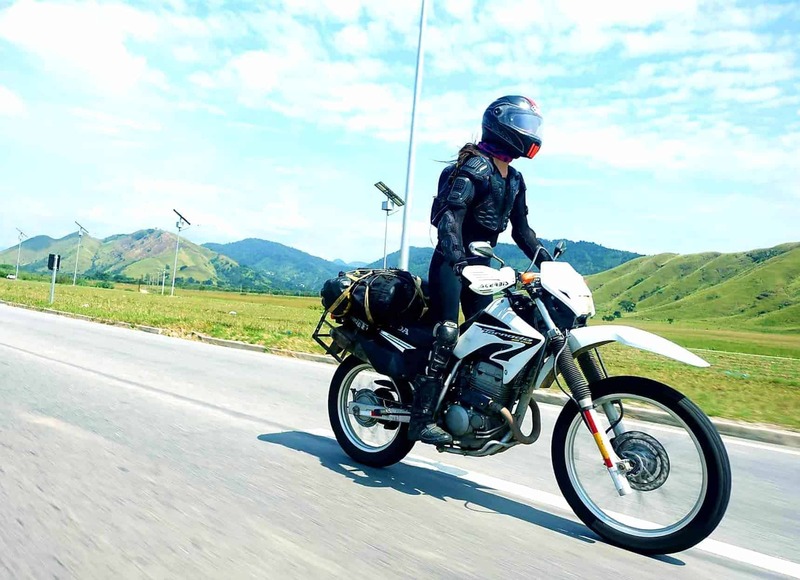 In February Grace loaded up her KTM 690 Enduro, and set out to ride overland through Asia and the Middle East, all the way to Paris. She has no time schedule. It’s not as ubiquitous or as frequently nicked as the mighty 10mm spanner, but my telescopic magnet makes an appearance in almost every roadside repair. Need to get to the injector, valve cover, or clean the air filter? You’ll be needing something to pull that airbox bolt out of the shadowy depths. Dropped an M16 bolt down the bash plate? Telescopic magnet. Need to adjust valve clearances? Telescopic magnet. To some extent my love for this tool is specific to my bike, a KTM 690 Enduro. The valve clearances are adjusted using shims, and it’s something you find yourself checking frequently because of the known vulnerability of the rocker arms to bearing failure. Since accidentally dropping a shim down into the engine case is not something that I want to do beside a road on a remote island, you won’t catch me traveling without my telescopic magnet. I also lend it to plenty of people on Japanese bikes whose fingers are just not small enough to get dropped bits out of tiny spaces. You could manage without it most of the time, but it makes things safer, easier, cleaner, more efficient. In turn, that means you can be more focused on the task and less likely to make a mistake. For repairs that don’t involve motorcycle disassembly, however, my all-time go-to is race tape. Some call it gaffer tape; it’s strong, wide, waterproof, reinforced with woven fibers. Smashed plastics? Sorted. Gear shift lever folding up because the spring broke? Sorted. Hole in your plastic fuel tank? Race tape plus bathroom soap and you might make it to the next town too. I once use race tape to reassemble the smashed fiberglass front end of a nitro funny car, and then watched the repair hold up beautifully for another quarter-mile pass at over 400km/h. I’ve never left home without race tape since. 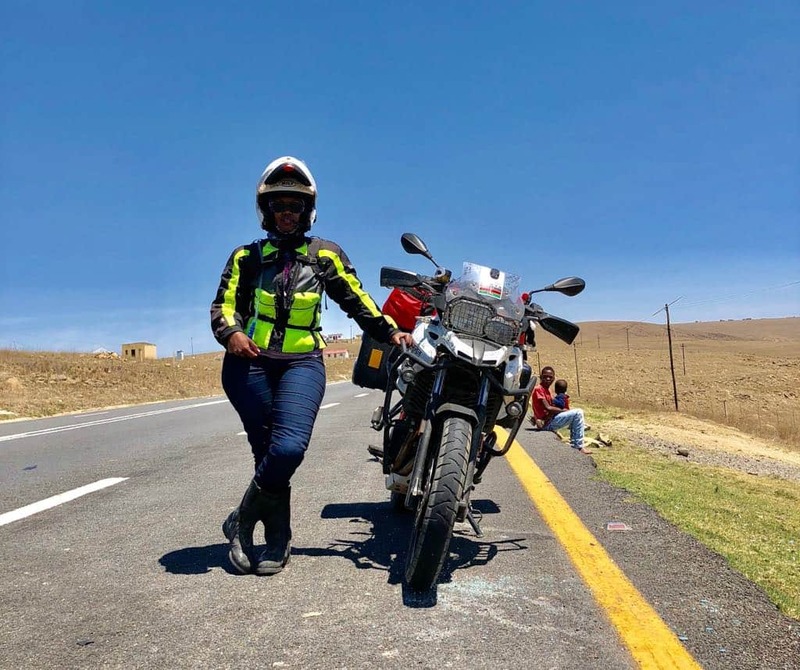 Wamuyu is the first Kenyan lady long-distance solo rider. 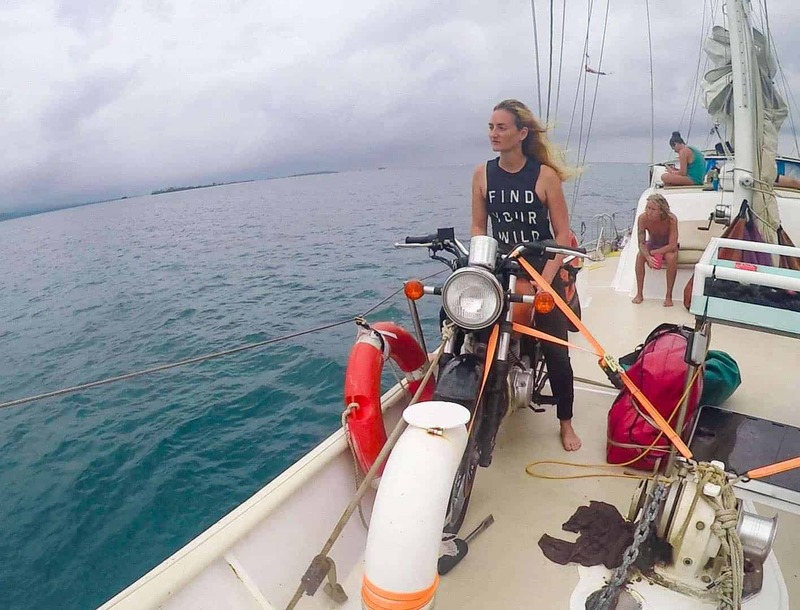 In 10 days, she covered 3,100 kms from Nairobi and Tanzania’s Lake Tanganyika and back via Mwanza in Kenya. She is currently on a 3-year RTW trip with her husband Dos, the first Kenyans to do so. I love the leatherman for the ability to do many things. It’s my technical tool as well as my kitchen friend and grooming partner. I do carry the toolkit that comes with the bike all the time but if I were to choose between the two, I would take the leatherman. 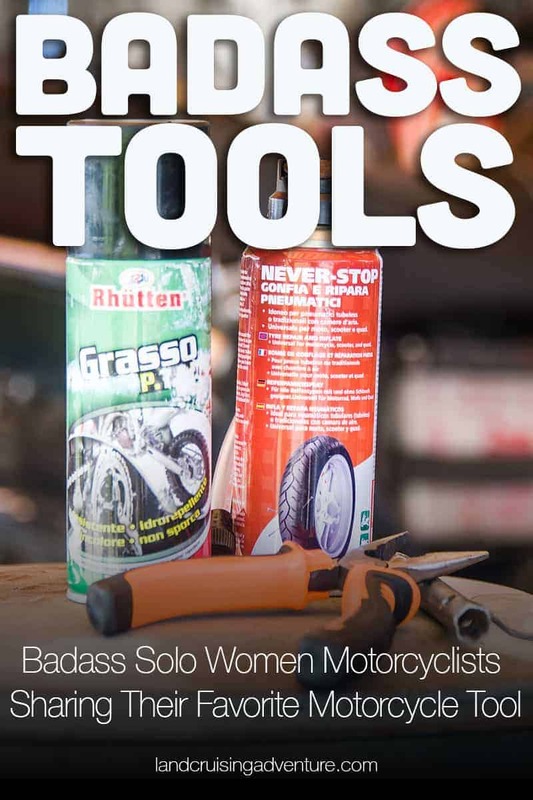 I can get tools for the bike anywhere on the road and can also get help with that but in my own private space, this one can not be substituted by the other. 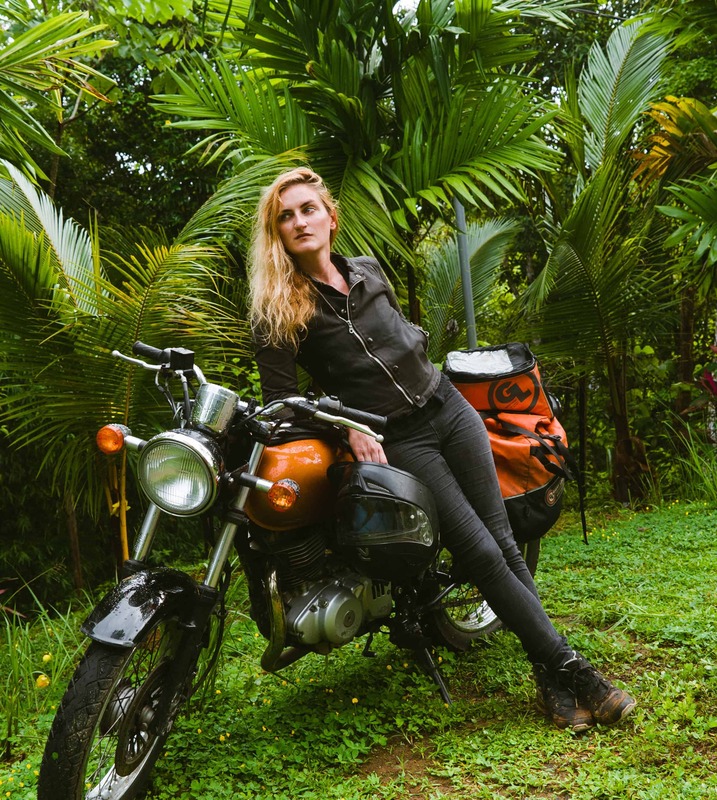 Dani started her adventurous solo travel early 2017 on her Suzuki tu250x with the goal to drive from the US to Argentina. Being hit by a truck landed her in the hospital and a wheelchair. After a long process of recovery she’s back on her bike, making her way south. I bought the digital air-pressure gauge years ago for a cycling trip. 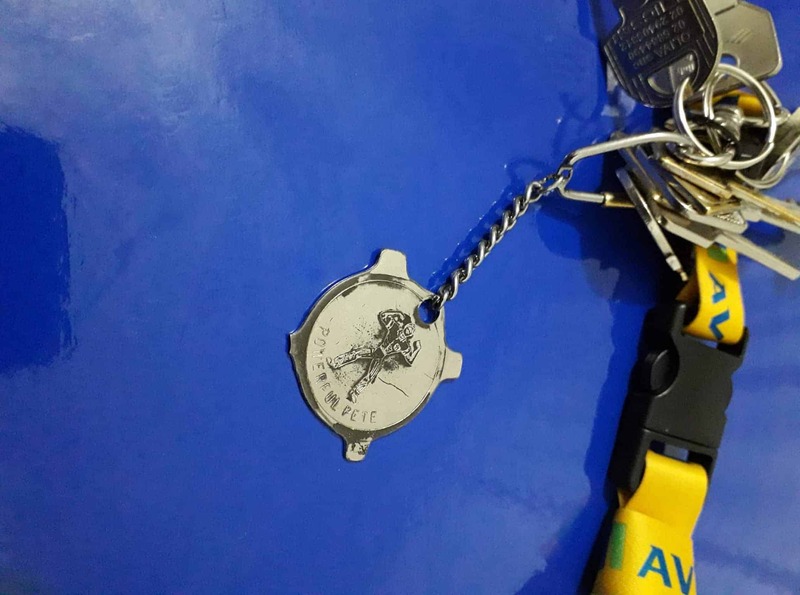 It became one of my gear staples and every time I ride I ritually check my tire pressure, turning the gauge on with a press of the rubber button, clicking through to ‘PSI’. I won’t go anywhere without this little gauge. In all the years I’ve had it I’ve changed the battery only once. I don’t like carrying many tools because I’ll find a way on the road when thing go wrong. I will talk to people to find a mechanic or somebody else who can help. But I do carry my father’s keychain and pocket screwdriver. It’s old and ruined but my father always carried it with him. I like to think it brings me good luck. Its name is “Powerful Pete”. Marta has no time for another motorcycle trip right now because she is on another, exciting adventure: opening her own Italian restaurant Crespi 14 in Milan. So overlanders in Europe, take note: stop in Milan and make sure to taste one of Marta’s super dishes (she cooked for us, so I can vouch for her cooking :-)). Inspired? Pin it to your Travel Pinterest Board!